Many of us can remember as a child being fascinated by maple seeds, with their single wing, spinning gracefully to the ground. As it turns out, scientists also have been amazed by this process. So much so that since the 1950s, engineers have been trying to replicate the flight of these seeds. Maple seeds, a type of samara, use autorotation to create passive stability. Autorotation is a deceivingly complex process. Essentially as a seed falls, it begins to rotate on it own around its center of mass, the seed. This causes horizontal airflow due to the wing’s rotation and vertical airflow due to the seed falling. The resulting forces are an upward lift, opposing gravity, and a horizontal drag. 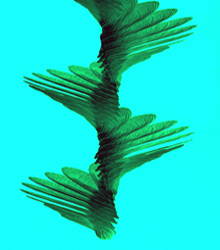 Because the tip of the wing is moving the fastest, it has more lift than any other part of the seed, therefore the wing tilts upward. The angle of tilt, referred to as the coning angle, reaches a constant when the outward centrifugal force equals lift. Once all the forces are balanced the result is a seed rotating in a stable helical pattern and falling at a terminal velocity. In the past, engineers have failed to create a design that has the stability of the falling maple leaf. 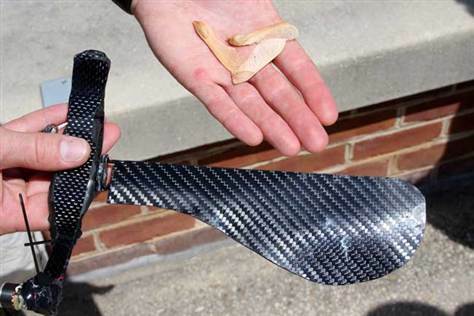 Researchers at the University of Maryland Clark School of Engineering finally developed successful design, called RoboSeed NAV, in which the wing and the propeller are separate components allowing the wing to tilt without moving the whole aircraft. The aircraft has a propeller to create torque which creates an upward thrust. Therefore not only does the robot glide to the ground, but it also had the ability to fly with great control. Another key element of the design was the fact that they created the wing to closely resemble the wing the maple seed. There are a couple of advantages of having an aircraft with the same aerodynamic properties of a maple leaf. First, minimal power is needed to maintain or create passive stability, which is beneficial to micro-scaled aircrafts that have minimal battery life. Second, if the aircraft runs out of power, it can slowly fall to the ground at a low terminal velocity resulting in minimal damage, thus making the aircraft very reusable. It is anticipated the design could be seen in toy stores in months from now. Eventually these flyers could be used as low atmosphere satellites that are completely autonomous (require no motor function), thus using no energy. They could also be used for mapping of caves and rooms. You beat me to it! We are going to discuss the maple seed in class soon. But your account has some details that very interesting. I wonder, how will micro-air vehicles based on the samara be used to map caves and rooms? They put a camera on the tip, and let it fall while capturing the scene? Sounds like a difficult technique! This is very cool. I was wondering how this type of flight could be used as a low atmosphere satellite with out any power. It seems like it would gradually fall towards the earth at a very slow velocity. Well in the msnbc article it says that if a point in the atmosphere has a thermal equal to the descent velocity of the aircraft, the motor would be able to be turned off and hover in the same place.